Bring your buyers to this move in ready home. Home is located in a community of 42 homes and has no rear neighbors. Relax on the screened lanai and enjoy the view. 3 bedrooms and 2 baths with tile flooring throughout except master bedroom. Enter into foyer thru double door entry and then into great room with vaulted ceilings, plant shelves, and the french door with patio/lanai access. Kitchen has a breakfast bar, 42 inch cabinets with crown, walk in pantry with plenty of storage and a spacious breakfast nook. The breakfast nook has a beautiful view of the backyard and the pine trees beyond. Step out to the spacious lanai and enjoy the privacy and tranquility. Dining area is to the left when you enter and is currently being used as a den. Master bedroom is oversize with room for a sitting area, office or treadmill. Master bath has a garden tub, separate shower and dual vanities. There are also his and her walk in closets. Split bedroom plan features 2 additional bedrooms and guest bath. Interior laundry with cabinet. Built in 2008 by Highland Homes. Robin model. Neighborhood is conveniently located off Johns Lake Rd for easy access to shopping, dining, entertainment, attractions, medical facilities, recreational activities and major roadways. 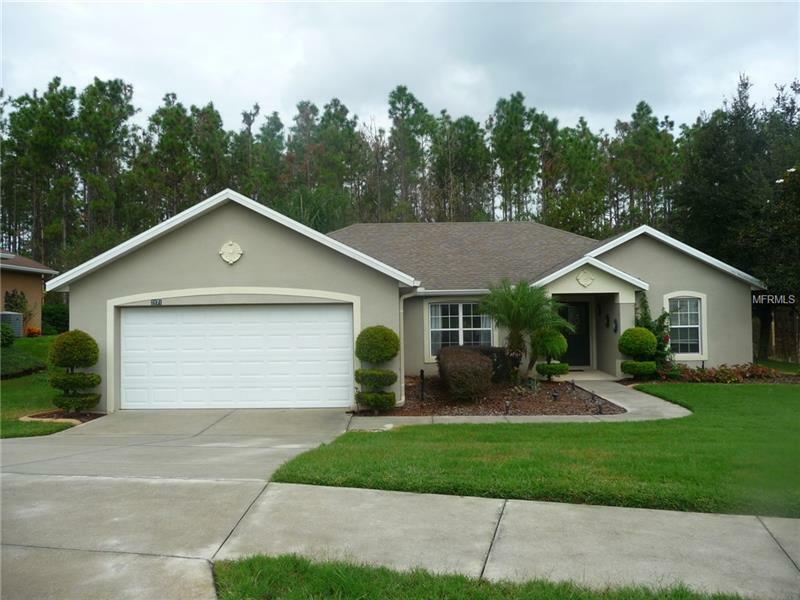 Clermont is easily accessible from Orlando with new turnpike exit located a few miles away. Enjoy the trail, new dining options and recreational facilities.